As an environmentally conscious company, Onesta believes that having social responsibility and social awareness is what makes them stand out from the crowd and actually go beyond FDA requirements to ensure all products are also EU compliant. Onesta donates 10% of its net profits to medical research, and the company is completely run by wind power to lessen its carbon footprint. This is an animal-friendly company whose products are approved by PETA. In addition to using responsible packaging for their products, Onesta uses natural fragrances in every one of their hair care products. There are no toxic chemicals anywhere; just certified organic plant extracts. That being said, you can be assured that when you purchase an Onesta hair care item, you will be enjoying a truly authentic and natural experience, with a free conscience that both nature and your hair are being protected and beautified in the purest ways possible. 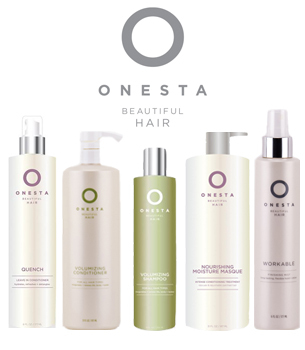 Onesta’s shampoos and conditioners are infused with a specialized Omega 3 Fatty Acid Complex for stronger hair from their roots to their very core. This complex includes a blend of Kukui, Macadamia and Sunflower Oils to hydrate hair and enhance its shine and health.